Maytag Maytag White, Large Capacity Gas Dryer with IntelliDry Sensor - 7.4 cu. Feet. This ultra large capacity SteamDryer will make laundry faster, more convenient and more fun. Enjoy all the possibilities of steam, including innovative features like TrueSteam that will have you ironing much less, or SteamFresh, a 20-minute drying cycle that means less waiting around for your favourite blouse. Bring rugged durability and commercial-grade dryer performance to your laundry room. Delivered straight from the Maytag. commercial washer and dryer assembly lines, this dryer features a robust build, including a premium motor and 7.4 cu. ft. capacity drum. These components are encased within thick, galvanized steel panelling engineered to take a beating and resist corrosion. Tough and dependable year after year, Maytag confidently backs this dryer with our best home appliance warranty for in-home, commercial laundry equipment. 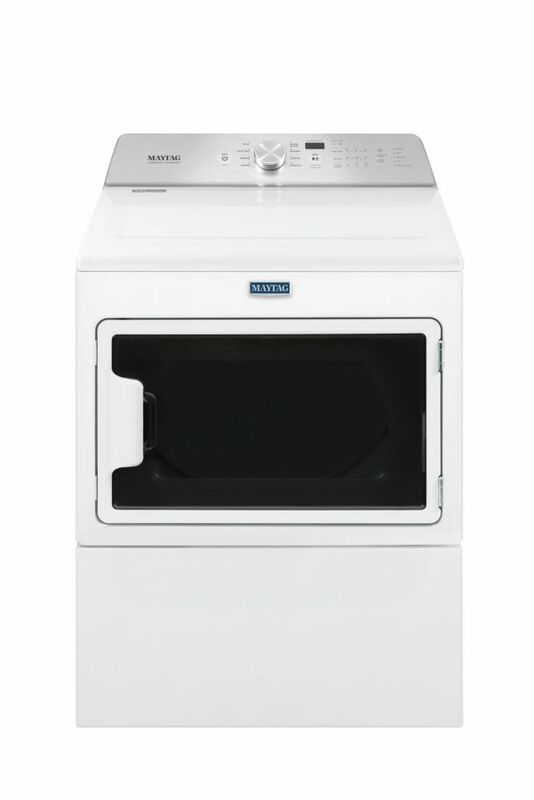 The DV7000 electric dryer features a large 7.4 cu.ft. capacity, which fits up to three baskets of laundry per wash. Sensor Dry detects moisture levels and adjusts drying times automatically. Unless explicitly stated otherwise, all washers and dryers are sold individually, not as sets, and all accessories such as pedestals and stacking kits are sold separately.